- The position accuracy can accord to the customer’s choice. 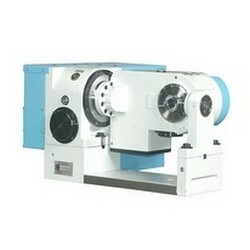 - Suitable for the engraving machine, modular manufacture. High-Speed Manufacture, and tiny parts manufacture. - Adopt EUROPE Direct Drive Motor. could be machined multi face with Simple 2010. - Pneumatic Clamping system, Adopted disk-clamping design (Taiwan PAP: 217736) to enlarge clamping force and ensure heavy-duty continuous cutting. - The rotary axis is closing to the tilting axis center. - The feature of wear resistant alloy dual-Lead Worm Gear is high mechanical efficiency of power transmission, high indexing accuracy, high indexing accuracy and easy adjusted on the backlash. - Driven by the servo Motor. Efficiently in position, high accuracy, Low noise and suitable for any angels working piece. 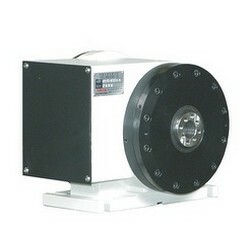 - It can be connected with CNC machine as 5 axis (5axis or 4 1axis). - It can be connected withsingle axis controller to connect with CNCmachine to perform tilting angle machining (4 1 axis). - Minimum Indexing degree: 0.001°.